What are the Advantages of Inflatable Movie Screen Technology? The inflatable movie screen is made exclusively for the outdoor movie experience. It has an inflatable framework in which a projection screen is attached. 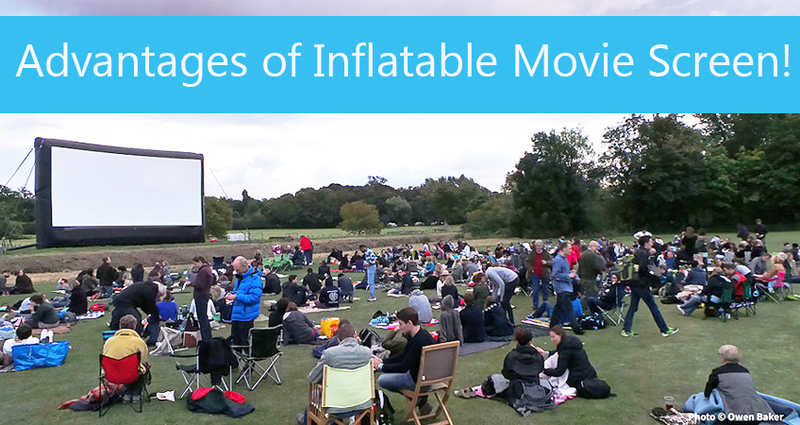 Apart from the outdoor movie experience in London, the inflatable screens find its use in film festivals, events like social, fundraising or sports, drive-in theatres and other such events where the outdoor projection of screen is required. The inflatable screens also work wonderfully when you play silent cinema in the open air outdoor movie screenings. In the UK, the inflatable movie screen technology has experienced a high rise in popularity in the past few years. It is so loved and favoured by the cine-goers and the event organizers because it has many beneficial features that provide them with a better screening experience. The inflatable movie screens are mostly loved by the event organizers because of its high end and unmatched portability. They are small in size and thus very easy to carry and set up anywhere you want. The compact size and easy portability make it the best choice for having movie experience almost anywhere you want, like the floating barges or even on the backyard of your house. When the number of viewers is large and the available space is less, the compact inflatable screens proves its worth there to umpteen levels. So, the next time you plan movie dates with your family and friends in your courtyard, go for the inflatable movie screenings for having a relaxed time enjoying the movie. When people opt for inflatable movie screen hire for any event, they normally choose it because of the property of easy assemblage. It means the time taken to set up the inflatable screen and then tearing it down after the event is over is lesser as compared to the other forms of outdoor movie screening options. It takes about an hour to do the entire assemblage of the inflatable screen and thus the production costs are also reduced to tremendous levels. So it is favoured by the event organizers as it saves them some bucks along with easy assemblage options. The event organizers are obviously benefitted because the assemblage and parking costs are lowered when people go for inflatable cinema hire rather than other screens like truss screens, etc. But not only the event organizers, but also the individuals and groups who hire inflated movie screening services for their events, are benefitted monetarily. The cost of hiring these screens is also low as compared to other outdoor movie screen technologies. The obvious reason is the low-cost maintenance and carrying costs by the screen providers which makes them able to give out the inflatable screens at lower costs without having to compromise with their profit shares. The other type of screens take too much of time to tear down as compared to the inflatable screens, as we read above. Thus, in adverse weather conditions, like rain and storm, it does not take much time to deflate the inflated screens and saved from any damage that the worsening weather conditions can cause hem. But in the case of other screen types, the time taken to bring them down is so much that most of the times they get damaged within that period of time. Also, it saves the audiences from any unnatural hazards that may occur due to falling down of the screen structures due to storm and wind. Well, you may think that the inflated screen technology is popular for the sound it creates, so how can it be said that the blower noise is reduced? Well, in the earlier inflated technology, the blower noise used to be making much louder noise. But with the increasing technical inventions, the blower noise is controlled and reduced to an extent where it no longer creates difficulty for the movie viewers. The high-end screens consist of damper boxes which help in reducing the sound and balance the noise produced from it. Around the UK, the option to hire inflated movie screen technology is easy and widely available. So, you don’t have to scratch your head in search of these screens when you want to have an outdoor movie experience with your family and friends, you can easily hire the services through online or offline agents. These are the advantages of inflated movie screen technology that has proven its worth in the past few years in the outdoor cinema market of London and is sure to keep up the impression for long for its advantageous features.